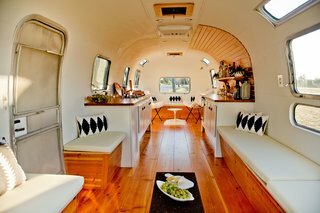 After a complete renovation, a vintage airstream is reborn into an eclectic event rental space. 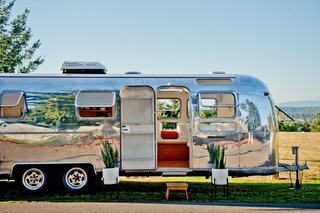 When Shelby Wilson bought a vintage airstream in 2015, she had a vision. It would be the ideal setting for a wide range of events, such as a VIP lounge for a corporate launch, as well as a mobile dressing room at a photo shoot or wedding. All it needed was a little elbow grease. 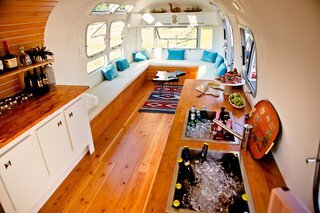 Wilson transformed the interior of this 1974 airstream so it could be used for a variety of purposes, such as a dressing room for Iggy Pop and Beck during the Project Pabst Music Festival in Portland, Oregon. 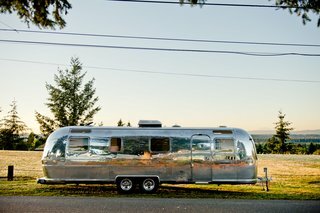 At the time of the purchase, "the airstream was a nightmare," Wilson explains. "The walls were brown from cigarette smoke, and it had been sitting rotting away for the past 20 years 'till I found her." 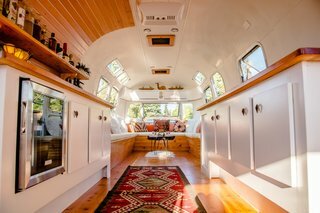 The interior includes a blue tooth/CD/iPod-receiver sound system, AC, and mini fridge. 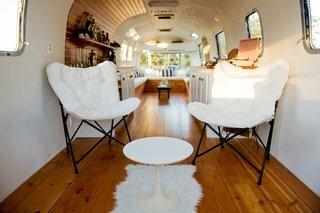 Wilson gutted the trailer to reinvent the interior with a simple, natural palette, inspired by her own midcentury home in Portland. "It took two and a half years and many different hands to make it happen," she adds. A double sink/ice well installed in one of the counters is ready for any kind of party. Now named the Stolen Pony Lounge, the vintage trailer is ready for any kind of party. White cabinetry is topped with wood countertops, and Doug fir slats create an eye-catching feature wall that curves up the ceiling. Restored windows and skylights also bring in lots of natural light. Wilson fixed a rotten sub floor and pulled out wet insulation to revamp the interior into a rental space. Clients can adapt the decor of the lounge to their needs, or choose one of the curated looks available. This front area can seat fifteen people. White walls and a motif of wood accents create a stylish, neutral setting. 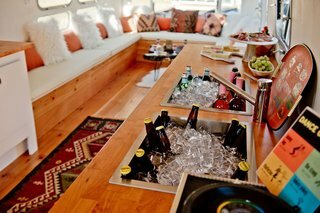 The back area of the 250-square-foot Stolen Pony Lounge is customizable to client needs. 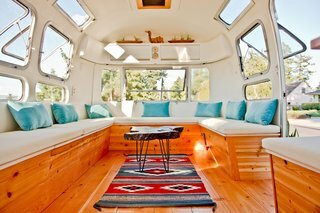 The Stolen Pony Lounge is based in Portland, Oregon, but will travel. Check out the Stolen Pony Lounge website for more details. You can also keep up with the vintage trailer on Instagram.